A Year of Beauty & Health? I Wish! It is 4 pm and the Husband has taken the kids to their swimming lesson. I am sat in blissful silence, save the now permanent sound of house renovation taking place in our street and the monotonous drone of an outsize lawn-mower chugging across the postage stamp of a lawn in one of the houses backing on to our garden. The day is unseasonably warm with the kind of heat that leaves you drowsy and heavy-limbed. I briefly tidy up the house and, in a fit of domestic fervour, whip up a blackberry and apple cake in tribute to what promises to be a golden autumn. As I wait for the cake to bake, I ponder all manner of things, particularly my various ailments, the latest of which is a strange tension headache which grips me either side of my skull at odd moments. I worry, given the presence of epilepsy and numerous brain tumours on my mother’s side of the family, that I am potentiallly a goner. Then there are the back exercises I am supposed to do to strengthen my lower back. And the hearing aids I am supposed to wear to help my tinnitus. The week after next I have one visit to Llandough Hospital and another to the Heath Hospital scheduled. Let’s put it this way, I am no stranger to the gynaecology department. 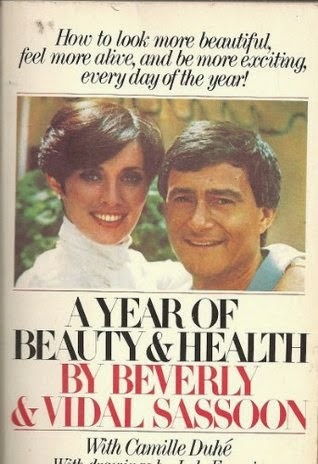 So it is with no small irony that I recall a book I once read many years ago by Beverly and Vidal Sassoon entitled “A Year of Beauty & Health”. It was written in 1975 and since that time I have had approximately a year of beauty and health! Actually the one piece of advice I can remember is that, when shampooing your hair, you only need a dollop of shampoo the size of a 10p piece. This was before celebrity hairdressers realised that, in order to sell your product, you had to encourage hair washing on a daily basis, together with conditioner, mask, conditioning spray, straightening balm, hairspray and a small payday loan with which to purchase said items. This is probably why I have a cupboard full of shampoo and conditioner remnants – the latest include Brazilian Macademia Oil shampoo and Elvive’s Fixology, neither of which have given me hair like the late Farrah Fawcett. I truly don’t understand how the Hair & Beauty Industry survives because it takes me an age to finish anything – from shampoo to cleanser and lipstick. I suspect that the houses of the United Kingdom are stuffed with half used beauty products whilst we all dance to the tune of the Pied Piper that is Beauty Industry marketing and walk zombie like towards Boots and Superdrug in a state of fervent anticipation.This is also probably why the annual beauty awards tend to go to the same products ad nauseum. Liz Earle, YSL Touche Eclat, Clinique Chubby Sticks, you know the ones. I wish I could remember what I’ve done with the Sassoon tome. Given the state of the old bod, there are probably things more important I should have been doing than rationing my shampoo usage. Like drinking 8 glasses of water a day. And exercising. That’s never going to be as exciting as a trip to Boots though, is it?